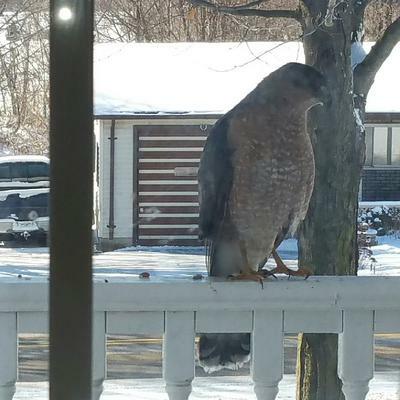 I have bird feeders outside my home office window and yesterday a hawk flew in to the maple tree and scared all his lunch away. He noticed me in the window and flew over to the porch railing. He Looked at me the way hawks look for about a minute and then he noticed the discarded Christmas Tree now being used as winter habitat for little birds. He hopped down onto the lawn beside the Christmas Tree and started doing the hawk style look and the little birds in the Christmas tree started to chatter. I stood up to take another picture and he flew away. About a half hour later I saw out the corner of my eye him swoop in but he was gone before I could see if he was successful in getting some lunch. Thank you for sending this report and picture, Tracey, our readers will enjoy this report.